We all know Peru is probably one of the hottest destinations in Latin America right now… and deservedly so. Named by many as the Egypt of the Americas – due in no small part to its incredible archaeological wealth. Peru also boasts amazing diversity in its ecosystems, everything from beaches, to desert, to mountains, cloud forests and the incredible Amazon basin. To top it off it is one the world’s top Gastronomic destinations, with Lima the capital having a bunch of restaurants in the world’s top 50 and is a destination in its own right. Throw in a few other amazing places such as Machu Picchu, Lake Titicaca, The Nazca Lines and the Colca Canyon and it doesn’t take very long at all to realise that Peru is well worth the hype! But where are the places the tourist to Peru should go to see more of this incredible country? Here at Chimu we pretty much have covered the country from top to bottom, left to right and have some ideas of our own for places that are amazingly unique and worth a visit – Even if you haven’t heard of them! Read on and get to know the 5 best places in Peru. The city of Cusco in Peru. Photocredit: Shutterstock. Best places in Peru #5: Caral . Photo credit: Shutterstock. Located 200km to the north of Peru’s bustling capital, Lima. 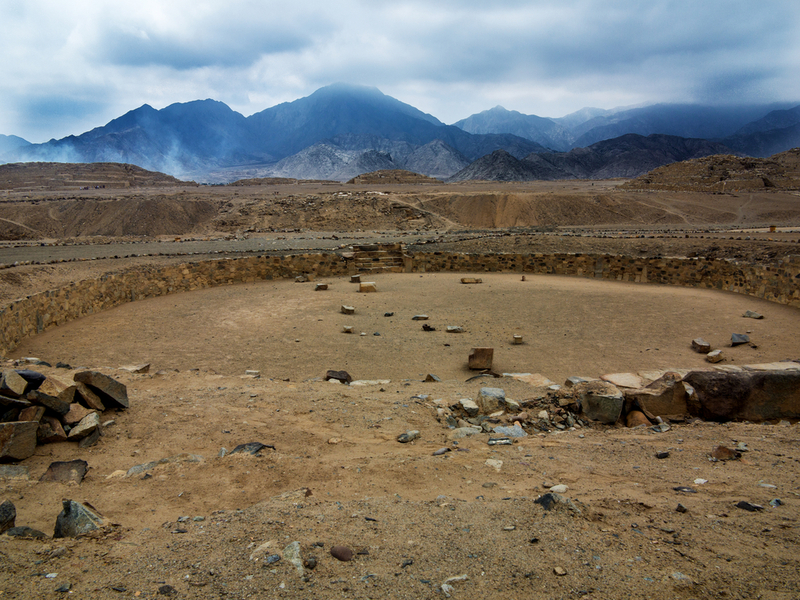 Caral is one of Peru’s most ancient sites, and quite remarkably one of its most recent discoveries. This sprawling historical site is able to be visited on a day trip from Lima (albeit a long one) and we think – well worth a look. It is believed to have been constructed over 5000 years ago (yes 5 THOUSAND), Making it one of the most ancient sites on the planet. It is a sprawling site of over 80 square kilometres made up of pyramids, temples and even a Geoglyph similar to the Nazca lines.. and a lot older. It’s a truly remarkable place. Spend time at the wonderful visitors centre and explore this ancient site. It’s going to be popular when word gets out..
Best places in Peru #4: Choquequirao. Photo credit: Shutterstock. Probably the most well known site on our list and absolutely on of the best places in Peru. Choquequirao has been known to backpackers for a good decade or two as an alternative mountain hike to the more popular Lares, Salkantay and of course Inca trail. 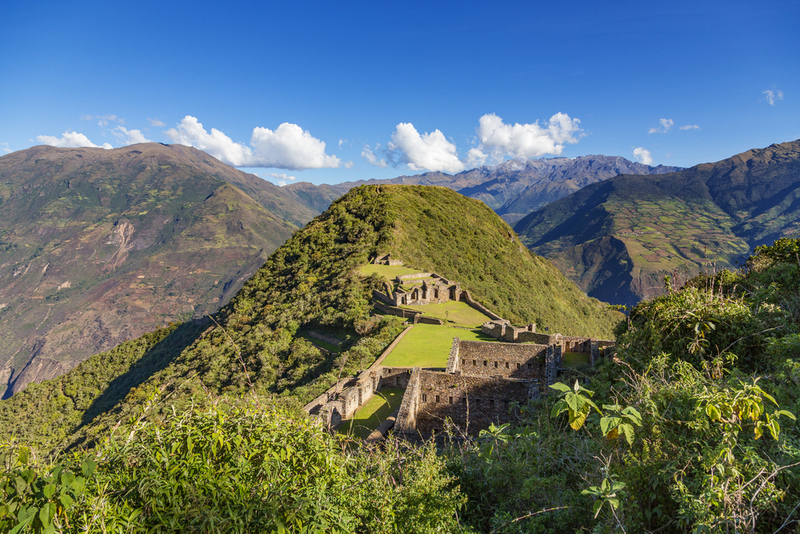 The Choquequirao site was an Inca site founded in the 15th century and re discovered in 1834 and is approximately 4 times the size of Machu Picchu. It is accessible by what is usually a 6 – 8 day round trip from the staging point in the sacred valley of the Incas. The trek can be quite demanding and is recommended for experienced trekkers. Visitors to this site will be greeted by an impressive citadel high in the Andean clouds, with some incredible stonework. The site shares some traits in its construction with the Chachapoya region. 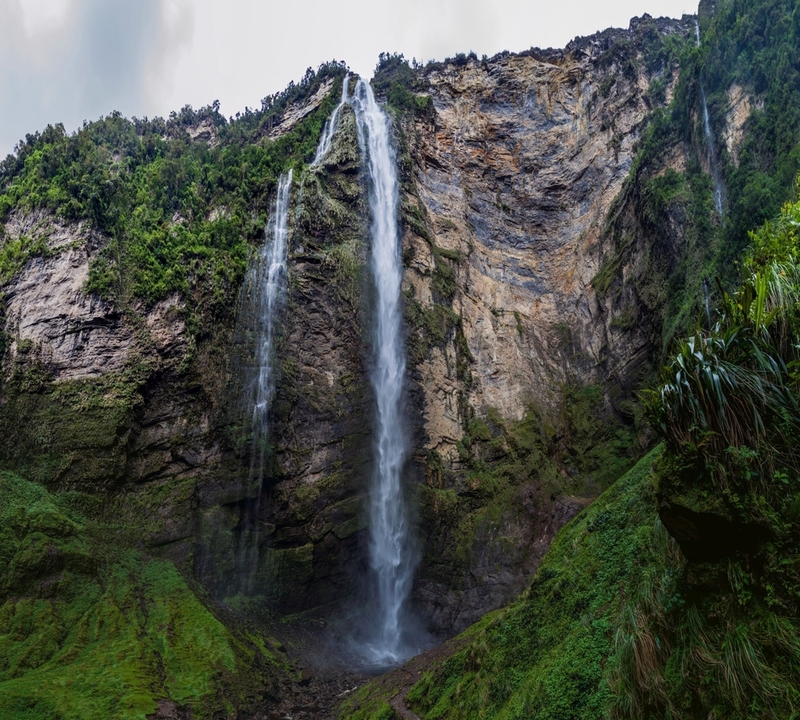 Best places in Peru #3: The Gocta Falls. Photo credit: Shutterstock. 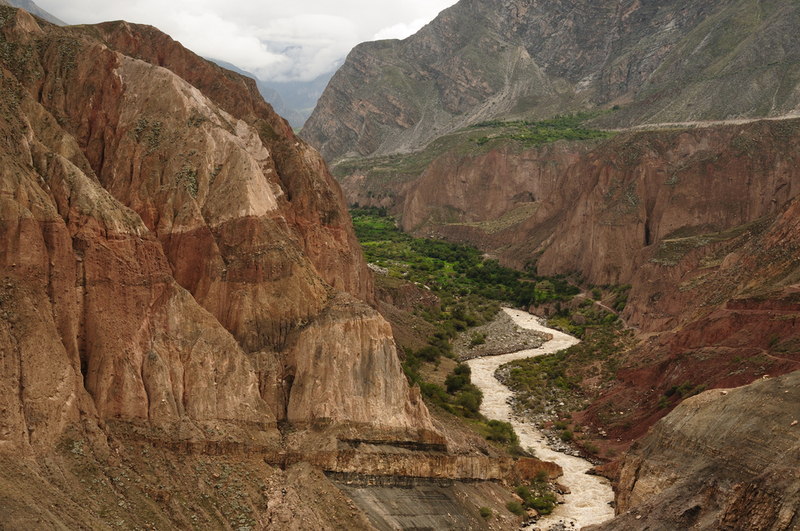 best places in Peru #2: The Cotahuasi Canyon. Photo credit: Shutterstock. Best places in Peru #1: Chachapoyas. Photo credit: Shutterstock. Chachapoyas is well worth a blog in it’s own right, read all about it here. Not for nothing Chachapoyas is #1 in this list of best places in Peru. This incredible site is known as probably the best preserved archaeological site in Peru after Machu Picchu. Access is quite limited, but it is opening up. 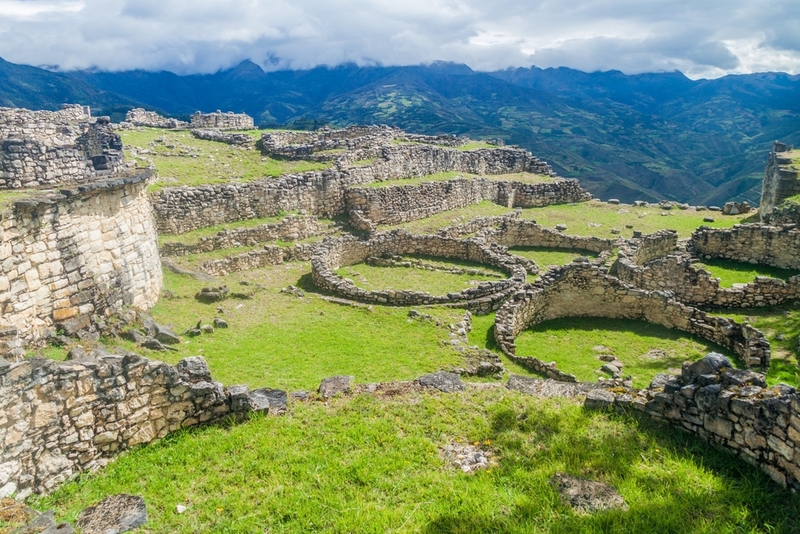 The general area consists of the imposing fortress of Kuelap and the caves and ruins of the Chachapoya people, rumoured to be tall, fair skinned people from a faraway land that inhabited this remote part of Peru and built quite a remarkable legacy around 800 AD. Some say they were lost Irish monks that made their way up the Amazon, others say they were from the lost city of Atlantis.. there are plenty of remarkable theories and legends about the site and the people who inhabited it. Word of the Chachapoya is spreading, and the site is increasing in tourist numbers year on year. It is a remote site, and can be added to most tours to Peru. The Peruvian government have recently authorised for a Swiss company to provide access to this remote site by cable car which the hope to have operating by 2018. Road and other infrastructure continues to be developed. Our hot tip is that in 20 years, the site will be just as popular as Machu Picchu – get there before the world finds out.